Modeling of cooperative behavior has great relevance to a wide range of scientific fields. Often trivial systems with primitive standalone behavior produce rich dynamics working in collaboration. 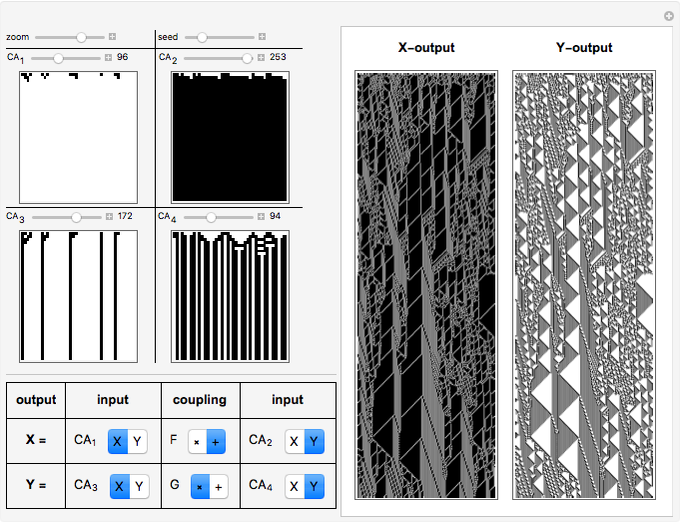 This Demonstration allows you to couple up to four different one-dimensional elementary cellular automata (1D-eCA) and produce behaviors beyond those of single 1D-eCA. Patterns of these 1D-eCA in the standalone case are shown in four rectangles on the left. 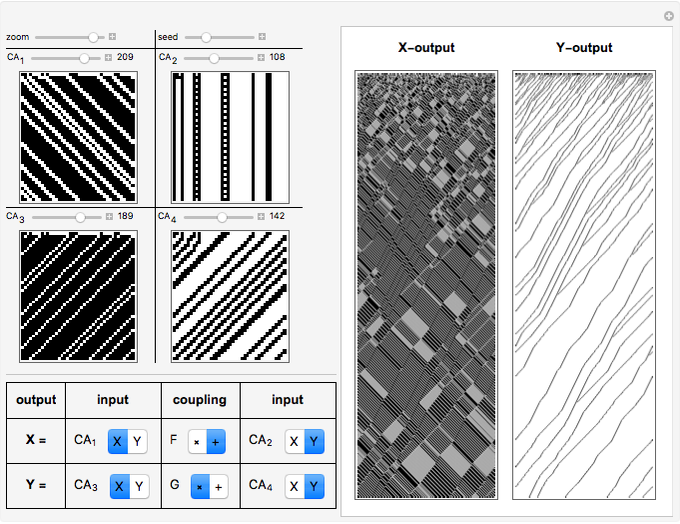 They can be compared to the two patterns of coupled evolution on the right (the rectangles labeled -output and -output). Often, simple evolution of standalone 1D-eCAs results in rich coupled dynamics of and . Such behavior is "symbiotic", since the coupled behavior of and cannot be obtained from standalone 1D-eCA. Another feature of coupled behavior is "synchronization". Namely, the pattern of is generally different from the pattern of , yet often similar "twin" sub-patterns can be noticed in and . In all images, the time of evolution goes from top to bottom. The four images on the left are just samples of standard 1D-eCA Wolfram rules. These four images are not used directly to create and patterns and are given only for comparison with and . Browse the snapshots for interesting patterns. See the "Details" section for a more technical discussion of the implemented coupling. Each parameter , , , can be or . and are coupling functions; each can be set to element-by-element multiplication "×" or element-by-element addition "+" modulo 2 of the vectors and . The result is interpreted again as an IC and repeatedly fed back into the same formulas. 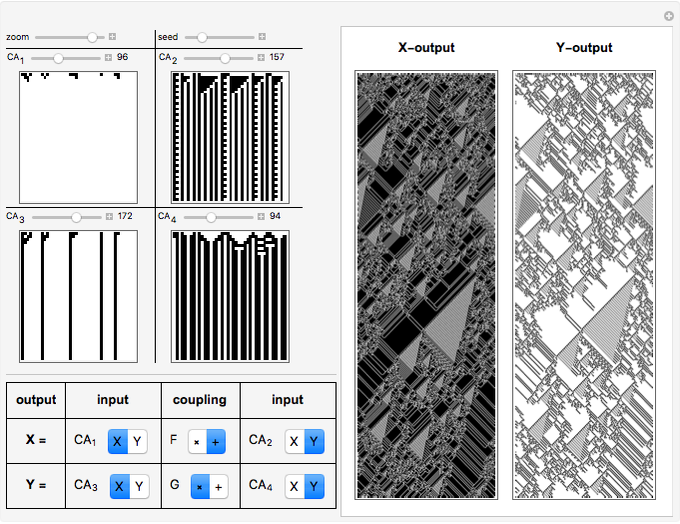 The evolution of and is shown in vertical rectangles on the right, labeled " -output" and " -output". Vitaliy Kaurov "Coupled Cellular Automata: Symbiotic Patterns and Synchronization"